Life is meant to be an adventure. It is meant to be lived FULL OUT, filled with passion, laughter and lots of love. 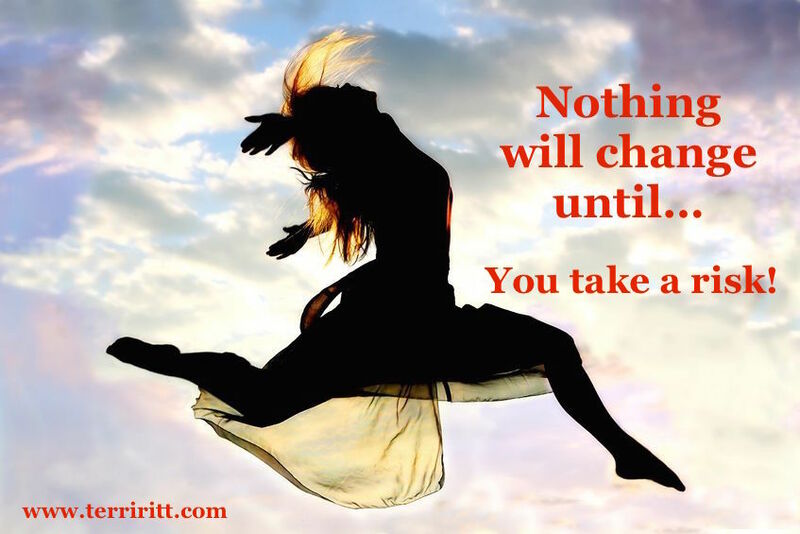 But there is one thing you must understand if you want this for yourself: Nothing will change until you take a risk. "Life should NOT be a journey to the grave with the intention of arriving safely in an attractive and well-preserved body, but rather to skid in sideways, chocolate in one hand, champagne in the other, body thoroughly used up, totally worn out and screaming, 'Woo Hoo! What a ride!'" Have you ever seen this little blurb on social media? I have no idea where it came from, but the person who wrote it, in my opinion, is brilliant! Taking a risk might mean that you leave a job that you've hated for years. It might mean that you go back to school because the first time around, you got a degree that wasn't really meant for you. Or it might mean that you finally say NO MORE to trying to make everyone else happy. Taking a risk can mean many different things. But, at the core, it's about trusting and surrendering to your heart. It is our egos that normally control us. Our egos tell us what we must do to survive. Our hearts, on the other hand, show us how to thrive. Our egos tell us what we must do to survive. Our hearts show us how to thrive. I discovered this truth at the age of 20. I was a sophomore in college and made the decision to leave school. I knew I wasn't in the right place. So, one day after talking to a friend, my heart said it was time to take a risk and leave. That was one of the best decisions I've ever made. Just a few months later I won Miss USA. I truly believe that if I had not been willing to take a risk, I would not have won that title. I have taken many risks over the years, but the most rewarding of all was giving myself permission to leave the status quo and travel a spiritual journey. A spiritual journey is one of non-conformity. It is about breaking the ties that bind and finding inner freedom. Well, finding that freedom within meant I had to embrace my gifts as an intuitive healer. Talk about scary! I have lost friends and even family members because I have embraced my gifts as a clairvoyant and energetic healer. But the one thing I have not lost is myself. And because I am in acceptance of who I was created to be, I am at peace. What a blessing! What part of yourself have you lost because you are afraid to take a risk? Are you stuck in a dead-end relationship? If your answer is yes, why haven't you left? What is it costing you to stay? Do you feel mired in the mundane? Are you sad or depressed? Only you know what needs to shift. I understand that you may have no idea where you're going if you take a risk. I felt the same when I left school prior to winning Miss USA. All I knew is that where I had been was no longer working for me. I couldn't see around the bend. I just knew that I was miserable and nothing was going to change unless I had the courage to take a risk. Courage is the key word here. Settling in life is based in lack and fear. Courage, on the other hand, is your avenue to a magical adventure. But here's the cool part. Courage to follow your heart is the energetic turning point where you begin to bring positive life-force energy to you. Our tendency is to think that taking a risk is scary and that it will threaten our safety. What's really scary is to miss out on the life you were born to live. Think about your life. Where are you short-changing yourself? What would your life look like if you took a risk? How would you feel? Do you have the courage to take a risk? What's holding you back? If you're mind is clogged with the "what ifs," that's your ego trying to take control. It wants to keep you in survival mode. Think of your ego as a little gremlin and tell it to get lost! If you can't shake the gremlin's nagging voice, go within and look for the false belief that's causing you to settle in life. You deserve so much more. You deserve a life of adventure, filled with magic and miracles! I'm so thankful I found the courage to live full out! My life is one big adventure. I often have people tell me that I have the most amazing stories to share, or that my life seems so exciting. What I know for sure is that my life would not be what it is if I didn't have the courage to take risks. So what do you think about this topic? Does the idea of taking a risk scare you? Have you ever taken a risk to see it pay off? How did it make you feel? Please share your comments with us below. We want to hear from you! What I know for sure is that you are worthy of being loved, supported and nurtured by the Universe simply for being who you are. That means taking a risk and following your heart. Terri Britt is a spiritual coach, inspirational speaker, former Miss USA, and the award-winning author of The Enlightened Mom. If you're not taking risks, then chances are you have deep-seated beliefs that say you're not worthy of being loved, supported and nurtured by the Universe for following your heart. It's time to stop the madness! Get a jump-start on shifting this mindset with The Worthiness Quotient Breakthrough Bundle. It's FREE!